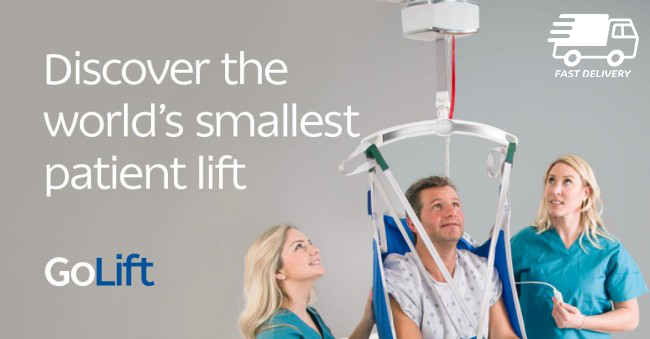 The GoLift is an ideal ceiling lift/hoist system designed for routine transfers of patients. Running on the low-profile GoTrack system, the GoLift is the most modern and advanced patient handling solution available. Installed in private homes, DFG and modification projects, schools and care institutions across the UK. For a market leading, aesthetically pleasing overhead hoist system, you need to look no further. The GoLift overhead hoist boasts excellent design features that will benefit users anywhere, whether in a private dwelling, changing places location, school or care home environment. The GoLift, which has recently won a Bronze award (Healthcare Design 2017), combines compact design with easy maintenance and flexibility. An example of this is that the hoist can be specified with its own GoLift track, or retro fitted to other manufacturers track; this is a huge benefit if you are looking to upgrade your hoist units without having to carry out extensive work. The slimline design means you get more lifting height, which is ideal in areas with limited ceiling heights. When you look under the cover of the compact GoLift unit, you will find an impressive set of all metal gears and state-of-the-art battery technology that allow the caregiver to safely, and effortlessly, transfer a patient weighing up to 50st on a single lift. For larger patients, you may combine two compact GoLift 700 systems to obtain a lifting capacity of 72st. Smallest ceiling hoist on the market, giving additional lift height and aesthetically pleasing finish – and weighs as little as 4.8kg! Different track options, including bends, gate systems and three depths to allow longer spans. GoLift track can also be recessed or inset into your ceilings – speak to an advisor for further details. Scroll down to see the latest case studies with this exciting product. To obtain a quotation or arrange an onsite assessment call our team on 0845 658 8411.